KEY: The key is located in the little white mailbox, right next to the front entrance French Door. In the event if your family needs more then one key, the code to unlock the door is 1511 and to lock, just press the lock symbol in the middle. Sometimes it take two attempts to make it work. SECURITY SYSTEM: I have ADT 24/7 monitored security system. Instructions are attached. In case if you do not feel comfortable to DisArm it the first time, please let me know. I can remotely DisArm it prior your arrival. Please be careful and do not set it off by accident. Note: Rules and Terms are inside of the place. Please be respectful to the place. I am laid back. I take damage deposit only for the major staff, so if you happen to break a plate or a glass, do not worry, mistakes do happen. On occasion, Comcast (Internet) is flaky, so in the event if the Internet gets disconnected, welcome to send me a text and I sort it out with them. The best way to reach me is via the site where the reservation was made. Welcome to Florida Accommodations. The guest have access to the entire place that they are booking. The address and the access code, the WiFi info are normally e-mailed to you closer to one’s arrival. The backyards, BBQs, outside tables, chairs, lounges, beach chairs, beach umbrellas, kids toys (if any) are for the common use. There are normally at least two BBQs per each property. Some are gas and some are charcoal. In the event if there is no gas, please notify me immediately and I will send someone to take care of it. I never had it happened, but I want yo to feel comfortable that all is good. Parking spot is one per the reserved place, unless you are renting the entire house, then the parking is unlimited. There maybe one extra spot on occasion, fist come first serve. If you arrive and there is no spot for you, please notify me immediately and I will sort it out for you. You may also refer to the manual inside to your neighbors, so they will comply with it. Which ever is faster and or you feel comfortable with. 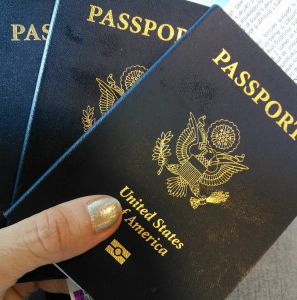 I normally do not have any problems, most of my travelers so far have been respectful and courteous. I offer Florida accommodations, tailoring to everyone unique needs. Regardless if you are a single executive individual that need one night stay, or a large MidWestern Family with a lot of beautiful children, or as you call yourself, mature and responsible, student who is traveling with the group of twenty over the Spring Break, I welcome YOU. 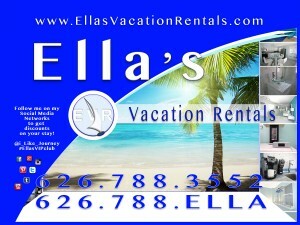 Welcome to Ella’s Vacation Rentals, the ultimate Florida Accommodations. Follow me to get discounts, last minute deals and other promos that I offer. Partnership and Affiliate Programs are offered. Please contact me and let me know what you are offering.